He remembered where we had met once – at a Canadian Science Writers event in Toronto. I think he remembered because of @venusbarbie. Yes, that sort of stuff gets you remembered. I told him I actually met him first at Nolan’s Pub in Cocoa Beach the night of the STS-134 Endeavour scrub — a surreal informal event with about 40 astronauts, NASA, ESA and other space organization staff. Plus a few star-struck spacetweeps. 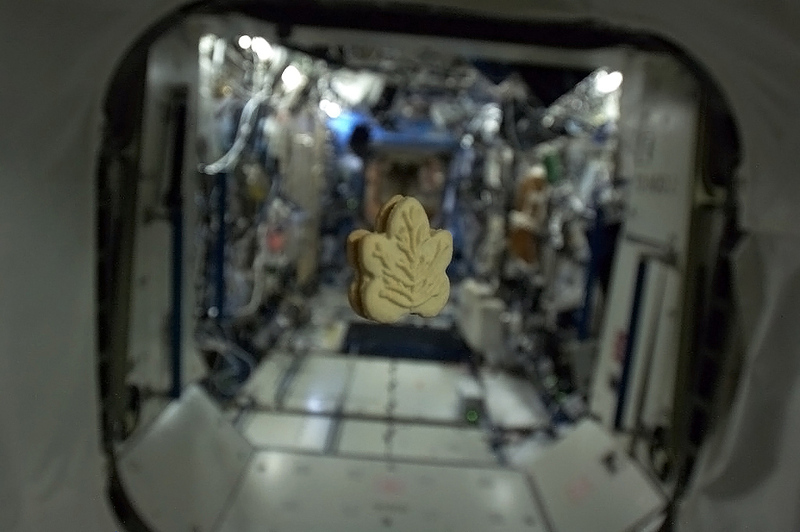 We talked about the maple cookies that I nominated to go to the space station. I sometimes bring these to events because they are so dang good and do a good job of representing Canadian sweets. And they smell wonderful. We talked about the amazing job he and the Canadian Space Agency did in promoting space exploration, STEM, and working hard to meet one’s goals. And #Chris2D. I really miss my travelling companion. I admire the wonderful people at the CSA and all they did to make these exciting thing happen. I can’t wait to see what they do next. We chatted a bit about his accomplishments before, during and after his mission. We talked about his future plans for where he will be living and projects he will be doing. I’m sure he’ll be tweeting about those soon. So why did I get the call? Officially, because I won a contest for nominating Canadian food to go to the International Space Station. Since he asked “You’re Datachick, right"?”, I’m hoping my prolific tweeting and sharing managed to help him in his work on space and STEM outreach. I can dream, too, right? It was a great honour that Chris would take time out of his busy schedule to personally call the winners of this contest. I am happy that I got a chance to tell him how much I valued his work and the out come of his efforts going forward. That’s one of the things I think is wonderful about all the astronauts, but especially @cmdr_Hadfield. During his mission it always felt that he put a lot of effort into ensuring that people understood why we have the Station, why space is so important, and why regular people like you and me should be paying attention. I think he managed to get a lot of attention for STEM, space and space agencies, don’t you? Thanks, Chris. For all you did and all you are going to do in the future. I can’t wait to see what you’ll be doing next. Even though Chris is back on Earth and moving back to Canada, you can still follow the astronauts on the ISS, including my good friend (okay, I met him a couple of times) Luca Parmitato (@astro_luca). Luca was Chris’s mission backup. Luca is currently sharing photos and doing interviews from the ISS. You should go follow him for more space goodness. Awesome! Congratulations. You’ve earned that honour by your enthusiastic work on spreading the news about this mission and the space program in general. It really was for the cookies. Food. But I so enjoyed the personal chat. No cameras, no press, no promotion. Just talking to an amazing guy. Karen Lopez recently posted..My Chat with Chris Hadfield. Yeah, It Was That Kinda Friday.